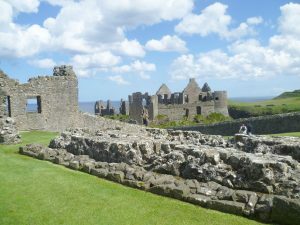 Indeed, Dunluce Castle’s real history, as well as its fantasy history, is also full of conflict and drama. In the 13th century, the Norman, Richard Óg de Burgh, 2nd Lord of Ulster, built a castle on top of an Irish hill fort here but nothing of either remains. 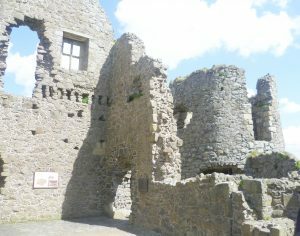 In the 15th century, the castle was taken over by the MacQuillans, who rebuilt it, only to have it badly damaged by the English Lord Deputy Perrott, who besieged it in 1584. Fortunately, Sorley Boy’s luck held. 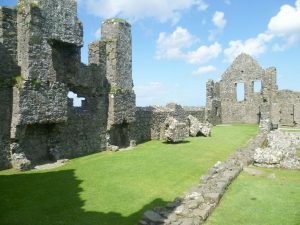 Four years later, in 1588, the Spanish galleass, La Girona, part of the Spanish Armada, having escaped the English fire ships, sailed around the north of Scotland successfully, but hit a storm a few miles east of Dunluce Castle and was wrecked on the razor-sharp basalt rocks. 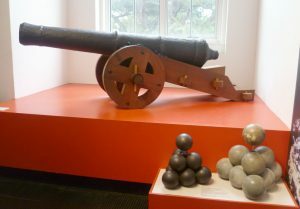 Two of her cannons were seized to guard Dunluce Castle’s gatehouse and the rest of the plunder was sold to restore the castle in the Scottish style. Sorley Boy, prudently, paid allegiance to Queen Elizabeth I, and James I made his son, Randal, first Earl of Antrim. The MacDonnells had arrived. Visitors couldn’t just go straight into the castle – that would depend on their status. But they were offered stabling for their horses and comfortable lodgings. Plainly, the Macdonnells wanted to demonstrate their superior status by offering visitors warmth, shelter, and, doubtless, food and drink – note the chimney stacks and fireplaces. To reach the castle itself, the visitor had to cross the drawbridge and, looking down, you can see how impregnable the castle is. It’s a long way down and the rocks breaking above the surface are sharp. 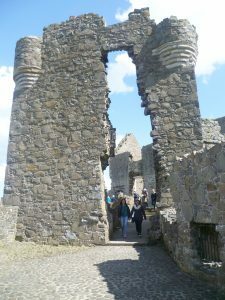 The gatehouse entrance. Note the Scottish-style turrets. The gatehouse entrance, once flanked by the La Girona cannons, is not exactly welcoming. 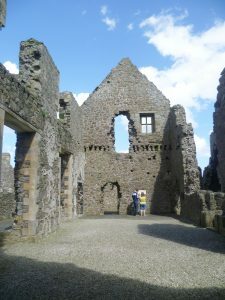 The visitor is met by an open area with the remains of the 1620 manor house on the right. It was built by Randal MacDonnell so that he and his wife to could enjoy some modern conveniences: fireplaces, a separate bedroom for himself and his wife; rooms for the servants in the attics, a Grand Hall, and so on. There was a separate kitchen attached to the Manor House on the sea side. 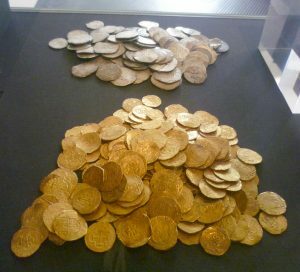 The story goes that, during a ferocious storm, part of the kitchen fell into the sea, leaving Lord and Lady Antrim without their their kitchen staff, their kitchen, or their dinner. Only the scullery boy, who was crouched in a corner, survived. The Countess, not unnaturally, refused to live there anymore. The archaeological evidence shows that this is not true; the kitchen is still standing. 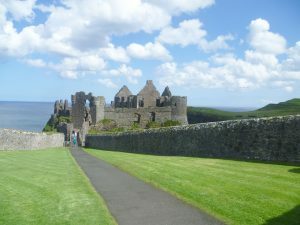 However, about a hundred years later, the north wall of the castle did fall into the sea. 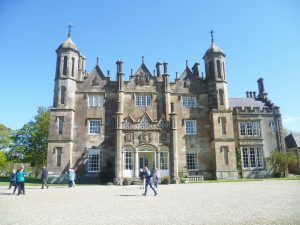 The family finally moved out in the 18th century and went to live at Glenarm Castle (see my post on Glenarm Castle Gardens, 3rd June, 2018). Glenarm is an impressive stately home, suitable for an earl and his lady. It’s has all modern conveniences: a large kitchen garden, a decent sized park and a formal garden. It’s not perched on an inhospitable rock and there’s no cliff near for it to plunge over. One can only imagine the Countess’s relief. 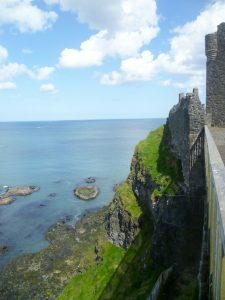 All the same, Dunluce Castle on its basalt rock is a spectacular place to visit.